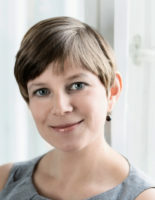 Petra Wodtke studied archaeology and Latin at Humboldt Universität zu Berlin, Université de Lausanne and University of Vienna. In 2014 she finished her PhD in Classical Archaeology at the International Graduate Centre for the Study of Culture in Gießen about communication structures of, with, and through archaeological objects in the Roman province of Epirus. She took part in several archaeological projects in, among others, Portugal, Greece and Albania. From June 2015 to March 2016 she worked for the Berliner Antike-Kolleg in the team of the Research Center of Ancient Studies who prepared the application for the Einstein Center Chronoi. In April 2016 she joined the research management team of Topoi. In addition she is academic collaborator in the cooperation research project Photo-Objects at the Antikensammlung, Staatliche Museen zu Berlin (SMB), funded by the Bundesministerium für Bildung und Forschung.